This activity was reported as completed as of October 2015. The “Toolkit for the Indicators of Resilience in Socio-ecological Production Landscapes and Seascapes (SEPLS)” was successfully produced and is available for download here. A brochure containing the Indicators themselves and basic information was also produced, and is available for download here. This activity is a follow-up project to another IPSI Collaborative Activity, which resulted in the creation of the original set of indicators (which were then revised and updated as a part of the present activity). Details on the earlier activity can be found here. One of the specific goals/activities of the Satoyama Initiative is to develop measurable indicators of resilience associated with linkages between human well-being and the socioecological production landscape mosaic, including linkages between wild and anthropogenic components of landscape and ecosystems; and applying these indicators to contribute to the implementation of the ecosystem approach. 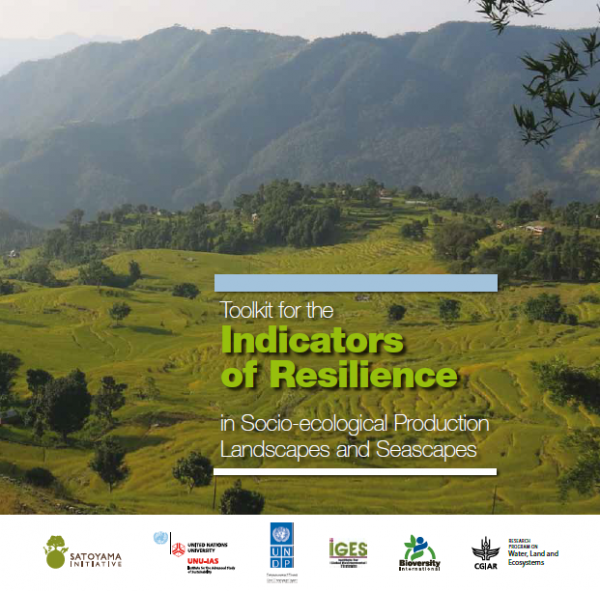 UNU-IAS and Bioversity International have been developing measurable indicators of resilience in socio-ecological production landscapes (SEPLs) within the framework of a collaborative activity under IPSI. Among other things, this led to the 2012 publication of a pamphlet on “Indicators for resilience in socio-ecological production landscapes”. Bioversity International has been field-testing and accumulating experience with these indicators in Cuba, Kenya, Bolivia and Nepal. At the same time, the indicators have also been playing a substantial role in the COMDEKS project, currently being implemented by UNDP, which aims to develop sound biodiversity management and sustainable livelihood activities with local communities. During the first phase of COMDEKS, the indicators developed by UNU-IAS and Bioversity International have been piloted in COMDEKS project sites in Cambodia, Ethiopia, Ghana, Fiji, India, Malawi, Nepal, Slovakia, and Turkey as a tool to help measure and understand the socio-ecological resilience of the target landscapes and to identify necessary activities to strengthen landscape resilience. In addition, discussion groups on indicators were organized during previous IPSI global conferences, where substantial feedback and suggestions were collected. While there has been strong interest in these indicators, they have not yet seen widespread use among other IPSI members/beyond Bioversity International and UNDP, due to the lack of a detailed toolkit on their practical application. To fill such a gap, a scoping workshop was held at UNU-IAS in April 2013 to sketch out the structure and components of the toolkit. Based on the workshop outcomes, UNU-IAS proposes to collaborate with Bioversity International, UNDP and IGES to develop such a toolkit, drawing on the expertise and experiences of individuals who have worked with the indicators. The objective of this collaborative activity is to develop a toolkit for the indicators for resilience in socio-ecological production landscapes and seascapes (SEPLS). This toolkit will help guide IPSI members and other interested organizations in applying these indicators to their fields of activity and utilize the results for various purposes. Based on the feedbacks from field testing and discussions among relevant stakeholders, these indicators will be revised to provide a more comprehensive measure of resilience and in a wider context (e.g., to include aspects of governance and seascapes). The toolkit is expected to be finalized in 2014 and to be released at CBD COP12. 5. Lessons learned from experiences, stories and good practices. In general, UNU-IAS and IGES will compile the information and develop the draft for the toolkit. Bioversity International and UNDP will provide relevant information, documents and templates. Bioversity International will lead the revision of the indicators as well as the drafting of the second section on updated indicators. It is aimed to finalize the toolkit by the end of Feb 2014. The lead organization and partners will provide resources as needed.